Another April 29th has come and gone. Since yesterday was a week day and we both had to work, we spread the celebration out over a few days. On Saturday, we went to dinner at a local Hibachi-style restaurant called Ginza. We had never been there before, but I had bought a Groupon to it a while ago for us to use. If you know anything about me, you know that I love me some Hibachi. I really liked Ginza; they included broccoli it their vegetables portion, which I really liked. When we got home, we hung out and caught up on TV. 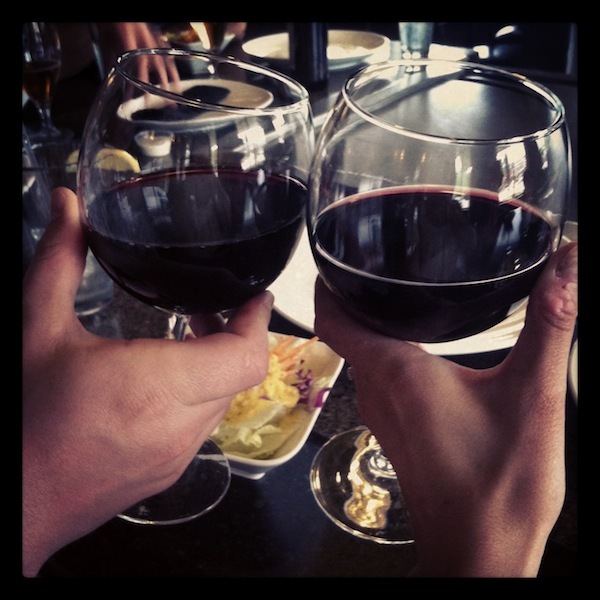 On Sunday, we decided to use Living Social deal that we had bought for a vineyard called Benjamin Vineyards & Winery. It was located off the beaten path in a town called Graham. We didn’t exactly have the most ideal conditions for a wine tasting in the country; rain was pouring down and the air was chilly. The tasting was set up in a barn – or at least it felt like a barn – and you basically just stood there and quickly tasted your choice of six wines. I know that this set-up was closer to wine tastings that I’ve been to before on Long Island, but our awesome, sit-down experience at Gregory Vineyards last month spoiled us. The wines were alright, but I think I preferred Gregory Vineyards over Benjamin Vineyards. Everyone working there was nice and the grounds were beautiful, but I think the dreary weather just tainted my overall experience. There weren’t any places to sit indoors and enjoy a glass of wine, so we sat in a seating area on the porch. Jay felt the opposite as I did. He liked what we tasted a little bit better and thought the entire atmosphere was relaxing and serene. 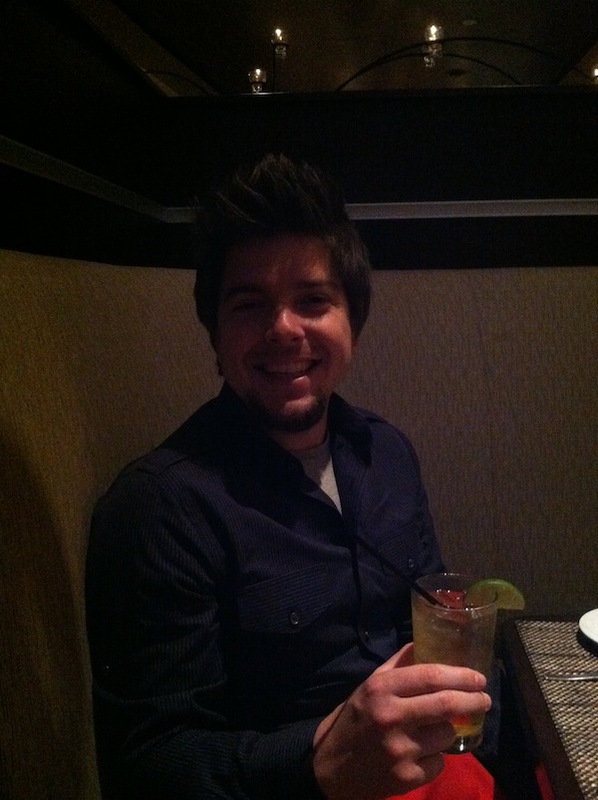 Yesterday, we went out to dinner at a restaurant in Downtown Raleigh called Solas. Solas has three different levels that serve three different functions. The first level is their restaurant, called Bia. That’s where we ate dinner last night. When you’re sitting at the restaurant, you can look up through a see-through ceiling to the second level, a nightclub called the Lounge. The third level is called the Roof and – you guessed it – it’s an outdoor bar that’s more ideal for Happy Hour and cocktails. Dinner was great. We happened to be the only ones in the entire restaurant for the first hour that we were there and when a group came in around 9 p.m., they sat at a table outside, so we basically still had the restaurant to ourselves. The staff was awesome. I ordered a dirty martini and asked if they had blue cheese stuffed olives. Turns out that they didn’t, but the bartender got blue cheese and stuffed his own olives with it just for me. I really appreciated how attentive they were to us. Sure, there wasn’t exactly a big demand for their attention, but they still could’ve left us and gone to kill time on Facebook or something. Anyway, the food and drinks were delicious. I should explain my “I accidentally drank 4 drinks” Tweet from last night. We each had two drinks during dinner. I’m not a big dessert menu person, so when it came time to order dessert, Jay got a “deconstructed cheesecake” and I choose to drink my calories with a side of blue cheese olives, haha. 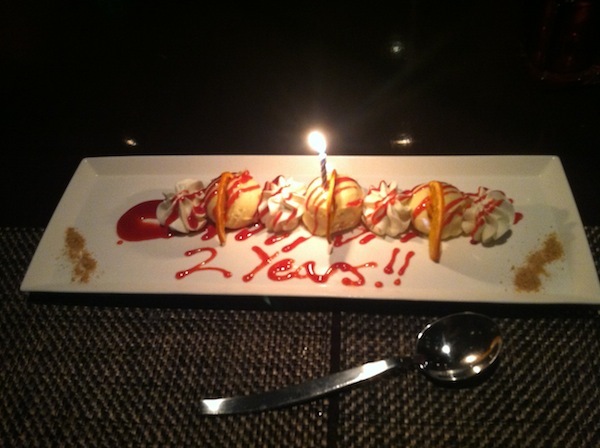 About 30 seconds after the waiter brought me my drink, he came back to the table with two champagne flutes and a little bottle along with a “Happy Anniversary!” message written on the same plate as Jay’s cheesecake. Jay only had half of his little champagne flute because he had to drive home, so I my glass and the rest of us. I guess technically, I should’ve Tweeted that I accidentally had 4 1/2 drinks. Oops, oh well. I did learn a lesson, though. My fingers were so swollen this morning from the salt in the martinis that I could barely get my rings on. It was awful. But at least I staved off a headache by drinking two full Nalgene bottles before going to sleep last night. Oh, good times, good times. And now for the only part that anyone really cares about: presents! Jay got me a really lovely necklace that I had been eyeing for quite some time now. It’s two circles intertwined with diamonds on the portion of the circles that criss-cross. My present to Jay was basically a part two of what I got him last year. 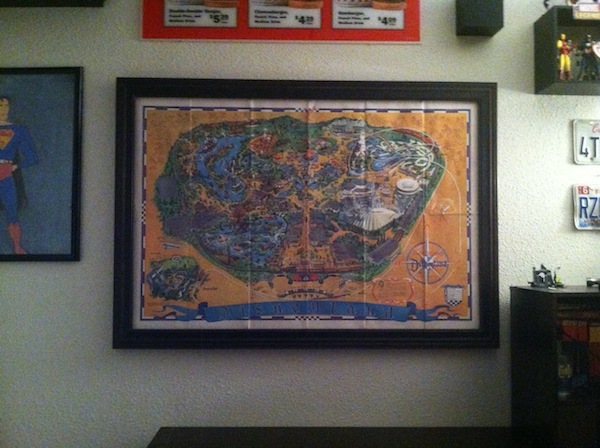 Last year, I bought him a huge vintage Disneyland map. He’s wanted get it framed for the past year, but the map is just so damn big that it needed to be custom framed and custom framing is really freaking expensive. This year, had it framed for him. It’s now hanging on the wall in the man cave and looks pretty darn nice if I do say so myself. We also got pleasant surprises from two of Jay’s aunts this weekend. Aunt Cindy sent us a little present that she made from a champagne cork that she kept from our wedding reception while Aunt Tammy sent us a disk filled with pictures from our wedding that we had only seen once before. I was so excited to get both of them. So there you have it, folks and future self who’s gone back to read this post. A nice little second anniversary celebration. Hooray. 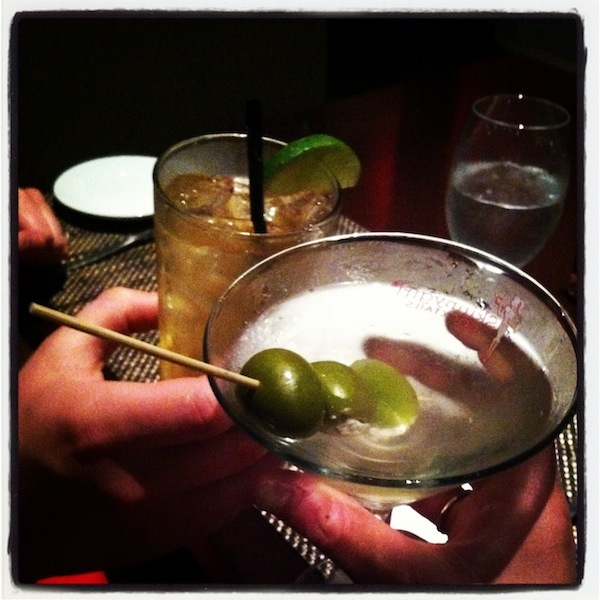 A toast at Ginza to kick off the anniversary weekend celebration. 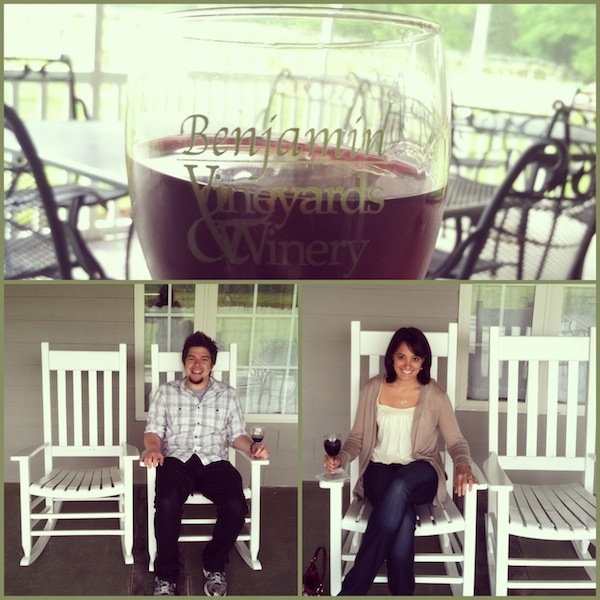 Our spot on the porch at Benjamin Vineyards and Winery. It was pretty serene. 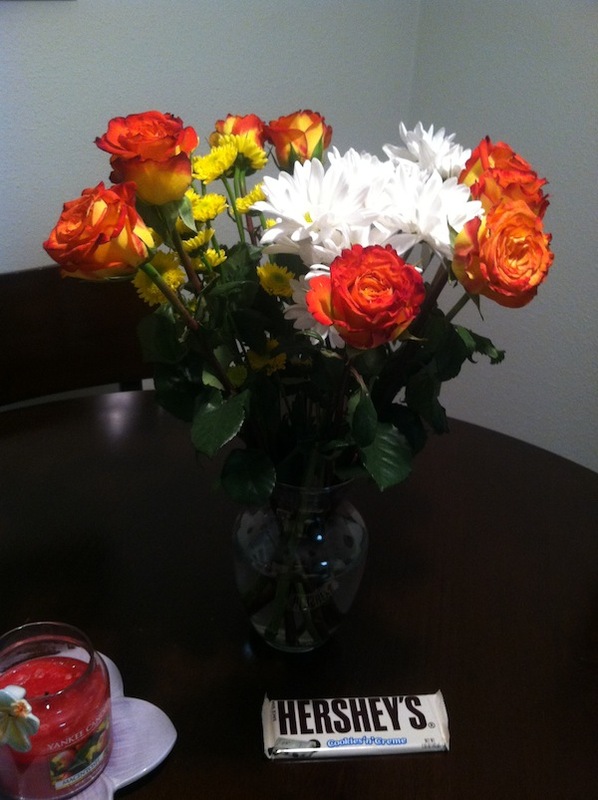 Anniversary flowers from my Smoopsys. I love that they’re so colorful. Jay, six years to the day that we met. Really good food. 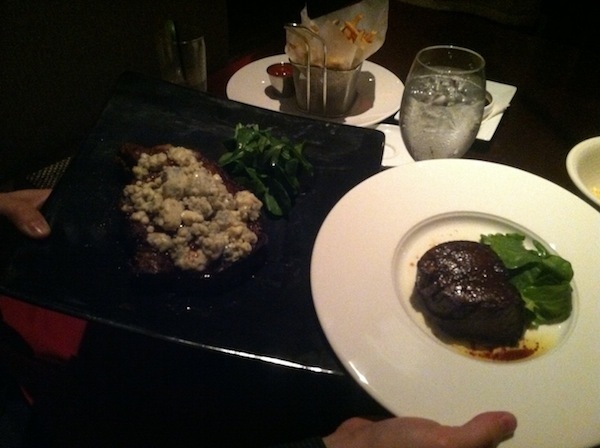 I got Filet Mignon and Jay got ribeye with blue cheese melted on it. Celebratory Deconstructed Cheesecake, which is pretty much exactly what it sounds like: cheesecake that’s not in the form of cheesecake. 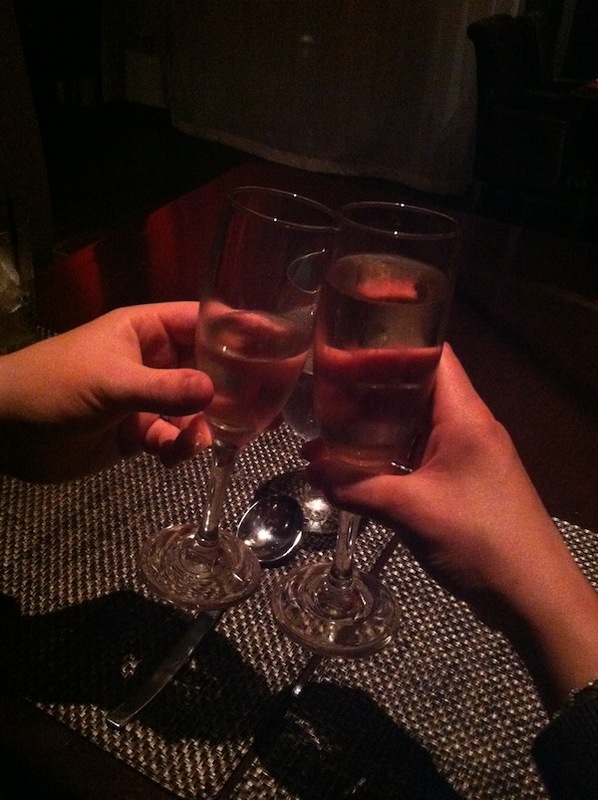 A toast to mark the ending of anniversary weekend celebrations and the beginning of Year 3. 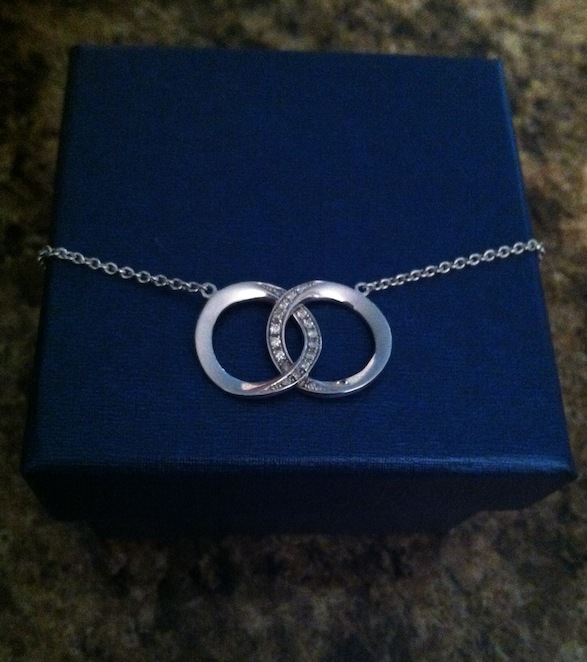 My beautiful necklace from Jay. 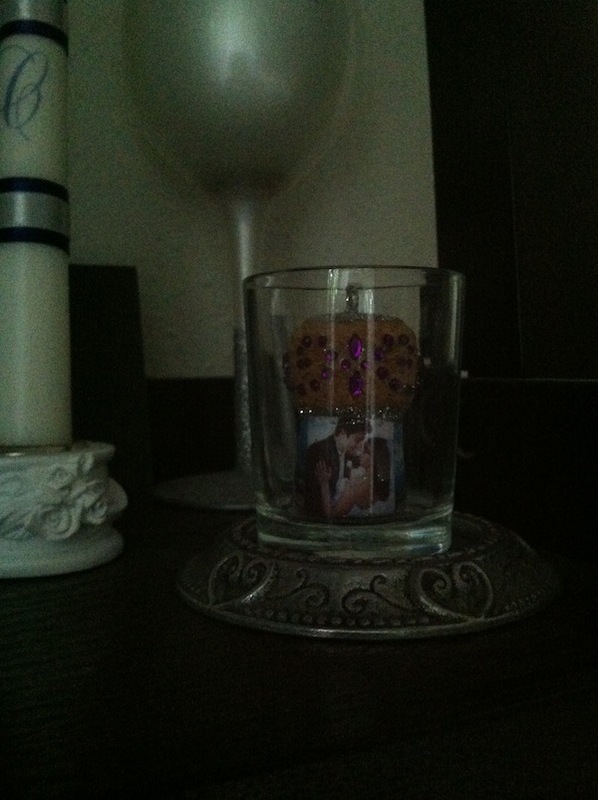 Cute little cork from our wedding day that Jay’s aunt decorated and sent to us. The picture that I used in yesterday’s blog post is from the CD of pictures that Jay’s other aunt sent us. This entry was posted in Jay Glatfelter, Married Life. Bookmark the permalink.